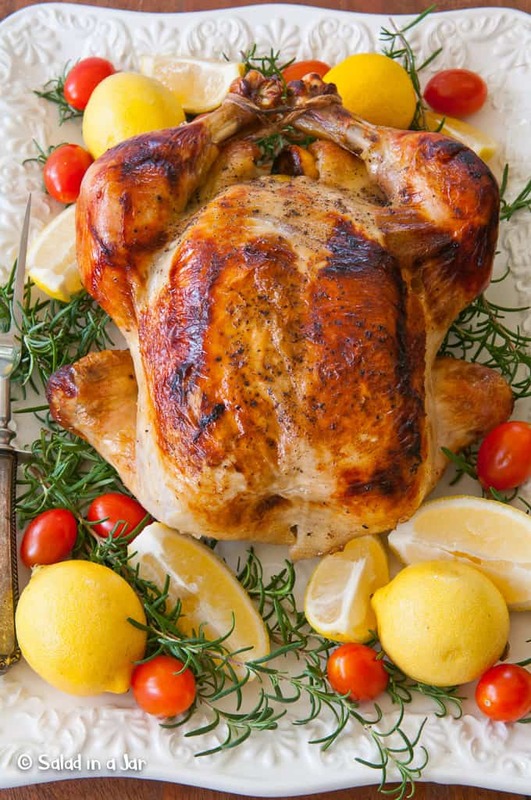 Roasted Rosemary Chicken is a whole chicken roasted with rosemary, lemon, and garlic. Use the broth and cooked vegetables to make a grain-free gravy “instantly” in a blender. the words “Wonderful Gravy!” are scrawled across the original, food-stained copy of this recipe. That’s why I make this Roasted Rosemary Chicken. The gravy is easy, foolproof, and flavorful. But that’s not the only reason. The smell wafting about in the house as it bakes is absolutely heavenly. When you finish eating the chicken, consider making chicken stock from the bones. Detailed instructions for homemade stock seen here. 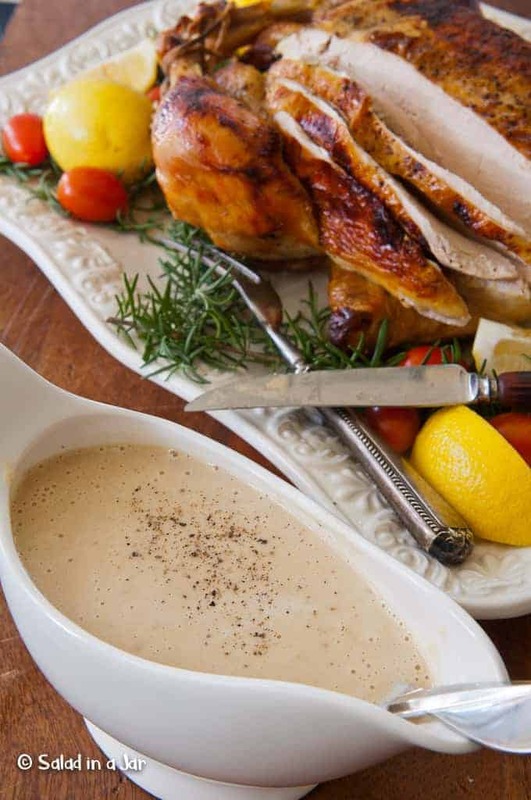 Now about the gravy–it is “instant” because you pour all the roast vegetables and juices in a blender with a little extra chicken broth. Give it a whirl for extremely smooth and tasty gravy without stirring, whisking, adding flour, making a roux, trying to get rid of lumps, etc. Only 6.6 grams of carbs in a serving of chicken and gravy combined. 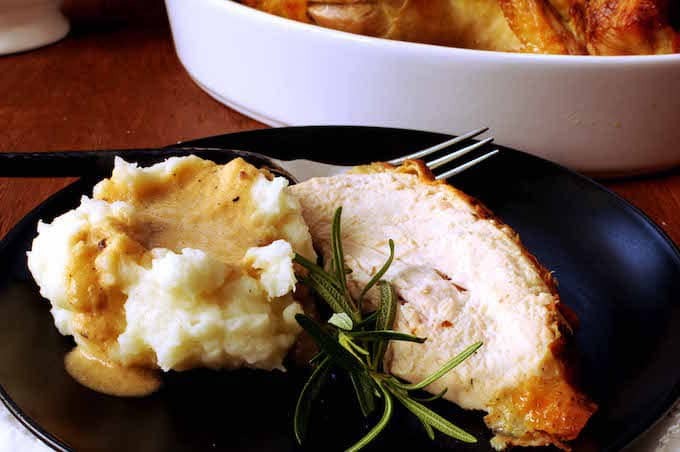 Serve this chicken with my Not-Mushy Mashed Cauliflower to carry out the low-carb theme. Admittedly, mashed potatoes or rice might be more popular with your carb-loving family and friends. Preheat oven to 450 degrees. Stuff washed and dried chicken with 2 onion quarters, 1 clove garlic, 2 lemon quarters and rosemary. (Optional) Tie the chicken legs together with twine and tuck the wings to the back of the chicken. 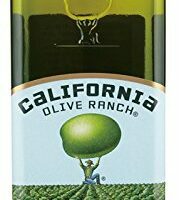 Rub chicken with 1/2 tablespoon or a quick spray of olive oil. Sprinkle with salt and pepper. Squeeze 1 lemon quarter over chicken. 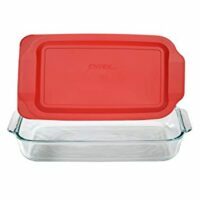 Toss remaining onions, garlic and oil in a 13 x 9-inch baking dish. Position chicken breast side down, over vegetable mixture. Roast 30 minutes. Turn chicken over, add 1/2 cup broth and roast 30+ minutes more until chicken registers 180 degrees on meat thermometer. Since I tend to buy larger chickens between 6 and 7 pounds, mine take longer (as much as an additional 60-90 minutes) so I always check the temperature of the breast near the thigh bone with a thermometer. If skin starts to become too dark, cover with foil. 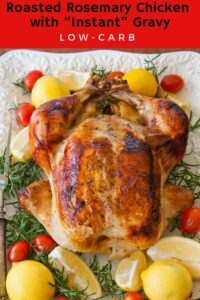 If roasting a larger chicken, reduce oven heat after 1 1/2 hour down to 375 degrees F to finish cooking. Transfer chicken to platter. Loosely cover with foil and allow to rest before carving. 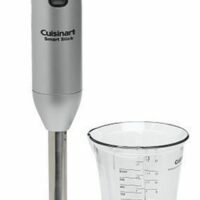 Pour roasted vegetables and chicken juices from bottom of the baking dish into a blender along with remaining 1 cup of chicken broth. Purée until smooth. Season with more salt and pepper. If desired, squeeze juice from remaining lemon quarter into gravy. Reheat if necessary and stir well before serving. This recipe looks delish. I am always looking for new ways to make gravy–are the pureed roasted veggies just the onions and the garlic? Excited to try this dish. Thanks for sharing. Correct. The onions and garlic are the only vegetables. Hadn’t thought about this recipe in awhile but looking at the picture again is making me want some tonight. It is so good! I will have to try that “instant gravy”! This is the second roasted chicken I have seen tonight. Guess what’s for dinner Sunday night? 😀 Looks great! I love your instant gravy, I’ll definitely give it a try. I agree…. gravy has always been my dad’s “doings”. I think I use flour or something, right? 🙂 This DOES look foolproof and delicious too! I do know how to roast a chicken, but haven’t used this method yet! What’s for dessert? Gravy has always been a mystery to me, but this sounds easy and delicious! Looking and sounding good! Unlike Amanda’s husband, mine loves rosemary, especially on roasted potatoes. Sounds fabulous! My hubby despises rosemary, so I have to use other herbs. The gravy sounds divine! THANK YOU! It’s funny, I bake all the time, but there’s certain cooking things where I’m a total novice. I’ve only recently started eating poultry again, and I’ve never roasted a whole chicken to save my life. Just today I was thinking about it, and was thinking that I need to find some detailed instructions. This sounds awesome and I’m definitely going to give it a go.